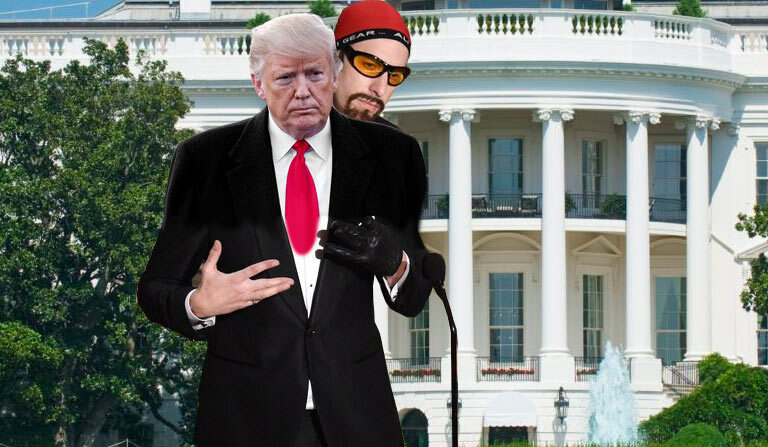 Comedy actor Sacha Baron Cohen, best known for playing Ali G and Borat, has today confirmed that President Donald Trump is in fact another of his crazy characters. Cohen, perhaps best-known for portraying the talentless rapper Ali G, let the cat out of the bag (or the hamster off of the head) on Twitter this morning after fans of the comedian became suspicious of a recent Trump speech. During the speech, Trump uttered the word ‘aight’ – which is an Ali G catchphrase. When called in the issue Cohen was left with no option but to confirm that Trump was in fact Cohen just ‘arsing around’. Cohen insists he never intended to become the President of the United States with what was nothing more than a satirical character. It was a laugh like, you know? I made this orange buffoon character and was shocked when I got my own TV show. Cohen was referring to The Apprentice, which ran for several years with Cohen playing the judge despite having no idea about business. I thought I’d be rumbled straight away. I clearly didn’t have a f*cking clue what I was talking about. Far from being rumbled, Cohen’s Trump went from strength-to-strength and the series was picked up in the UK where Lord Sugar played the Trump role. Cohen is keen to point out that pint-sized cockney wide-boy Sugar is a real person, and not another Cohen character. After The Apprentice I thought I’d up the game and run for President. I wanted to see how far I could take it. I never expected a fictional character to be running the free world. I tried to make it really obvious like, you know? I made up words, mocked the disabled and even said I was thankful for myself on Thanks Giving. Nobody was suspicious. It was only when Trump said ‘aight’ that Cohen’s army of fans caught on and the game was up. It’s not known what will happen to the US Presidency now after Cohen’s deception has been revealed, but Borat was seen entering the White House early this morning.